The hand of God has a green thumb and I’m pretty sure that’s why okra is the absolute best. I know some people claim to hate the “texture” but usually they’re referring to the way the okra has been cooked. Personally I haven’t met an okra dish I haven’t liked and I’ve had one made with okra powder that makes a sort of green gelatinous goo. I was maybe 4 or 5 years old and was being dragged along through the Sahara while my parents were off doing work “in the field”. And then again with “callaloo” in Haiti. It’s been a good life when you can enjoy one of your favorite vegetables across continents. I’ve only recently started cooking okra for myself but not because it’s difficult. It’s not always available and when it is here’s usually a family friend who makes it for me. “Spoiled”. I know. So without further ado, here’s just a few of the ways I know I like o eat okra as well as a couple I still need to try. Last summer I was getting all fancy with the gardening and the fresh stuff and piles and piles of lettuce to show for all my hard work. Thanks to my appaent inability to withold memories I went and planted flowers and herbs on top of where the end of last year’s crop went to seed. So what happened? Rogue lettuce. EVERYWHERE. It was growing out of the drainpipe hole at the end of the garden bed. It was springing up from between the cracks in the sidewalk. It was sort of grow up and through a rock?? And that’s not even the worst part. The worst part is that even with all that crazy ninja lettuce popping up everywhere and messing up my carefully planned out herb garden I’ve gotten about 10 good leaves from the lot of them. On the bright side (in the back where we get more sun) I’ve had so many tomatoes that the only thing I could think of after a while was to cut them in hlf and throw them in the oven so I could at least have something that still tasted like tomato and would turn to black goo on the countertop. I really hate it when tomatoes go bad. It’s super gross. But all those poor tomatoes I just didn’t rescue in time aside, I was left with only half a salad since I was strangely without any other ingredients to help make any salad I made be more than just chopped tomatoes with salt. It takes a special tomato to be delicious without some sort of additional lubricant with taste. 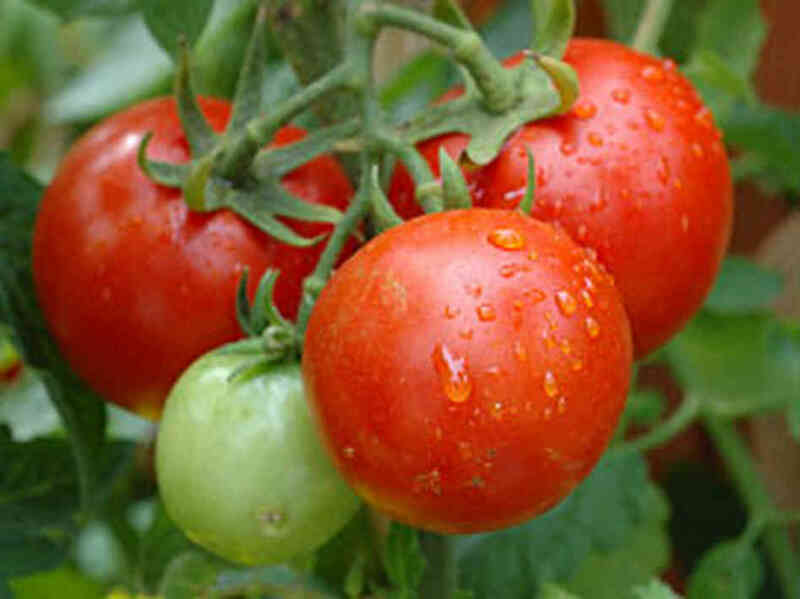 Here is a picture of tomatoes. But between work and more work and my entire fammily deserting me for the island homelands I have had very little to eat except vegetables for the last month. It all happened because my dear mother finished her radiation treatments (yay!) and it ended with a really really big last minute party where I tried to grill outside. Thinking I’d try something new for a big crowd I attempted making burgers. Like real burgers. The kind with meat cooked on an open flame. Well over charcoal. But alongside the semi-successful burger project I grilled about 5 billion pounds of fresh stuff: Eggplane, zucchini, yellow squash, onions, OKRA!, bell peppers, asparagus, baby bell peppers, portabello mushrooms, sweet potatoes, corn… You put the grilled veggies on a toasted bun with the aioli and a still cripsy-on-the-outside black bean burger (or a marinated and grilled portabellow mushroom if you prefer) and that makes for a good party! In the future, though, I think I’ll leave the regular burgers to a professional. The afterparty of this whole affair was me sitting on the sofa eating nothing but roasted vegetable sandwiches for the next week while watching “Chuck” and drinking the remains of my homemade “Make Your Own Juice Bar”. My favorite was the sparkling Persian Lime with an extra shot of sweetness from the ginger simple syrup. In honor of the vegetables (and “fruit”. That’s right, I’m looking at you tomatoes!) that kept me alive while living alone for the last month I’m dedicating the next series of posts with all the wonderful ways to eat them! Forget Those Fools and Get Yourself Some of These Fries! So on another Foodie Adventure this week. Actually it’s a work trip to learn more about our office database system (wooooo!) so technically I’m being paid to learn and take notes and present and stuff. But it would be a total shame for them to send me all the way down to New Orleans and NOT have me eat myself silly every day. I arrived in NOLA last night already exhausted from the weird flight patterns and shuttle ride and the whole it being the end of a long week thing. It wasn’t a good look for me. So the universe decided I needed a treat and the hotel I was booked in for the conference had gone and overbook itself. Why? Wrestle Mania. I think that speaks for itself. In all the need for hitting the ultimate profit margin my room had been given away and as recompense I was given a lovely corner suite on the 18th floor with free internet for the rest of the week. Needless to say, after a full night’s sleep I came back to my senses and trolloped around the room in a towel watching cartoons while researching where to go find breakfast. I settled on the apparently not-so-small-in-reputation Cafe Beignet around the corner from my hotel where I had myself a lovely breakfast of rather little import as well as a beignet offered to me by a nice gentleman sharing my table who is in town for an even bigger conference than mine. After that there was some work to be done on my other-other job (there are new blogs in my repertoire these day in the line of “guerrilla activism” for an area to which I am greatly endeared: hating stupid people) before an afternoon session clicking around in a database I spend almost 60 hrs a week in learning how to register people for meetings and charging them lots of money to make me. Muahahahaha! Gimme all your money! Aaaaanyways. Long boring story shorter there was a big reception in a super cool art gallery where I forced myself to say hello to a bunch of strangers (so not my style), check out the food (lines were way too long for little bowls of things), thinking about booze (but not drinking any because of recent issues with headaches). Talked to some lovely folks in Law and Alzheimers (different groups) and then headed back to the hotel to switch into my comfy clothes that make me look like I’m about 10 years younger than I actually am–not the most helpful thing when I already look about 8 years younger than I actually am– and planned a mini-adventure. I’d been looking up places on Yelp a couple days before coming down south and noticed this kind of random looking place with some interesting ratings on french fries. So I decided to make a little jaunt to what I thought was fairly close only to find that I was about to be working off the food before I’d even gotten it. I walked down some dark alleys behind where all the action takes place at night. Got a little worried when I realized I looked like a teenaged girl wandering around neighborhoods with no streetlights and low traffic but it seemed decent enough and no one raped or mugged me so Yay! But the fries… Yeah. They’re the best fries I think I’ve ever had in my life. And that’s saying something. They were super hot, had a crunchy coating, and we soft and fluffy in the middle. They were so hot, in fact, that they were still hot and crispy when I got the remainder of my precious cargo back to my hotel room where clothes were shed, ketchup packets were ripped open, and HBO was turned on. Yep, this is going to be a good trip. Welcome to the New Republic. Now with Booze! If anyone has been following the blog–back to when I spent almost every day touting the seemingly simple logic of: Go to bed at a reasonable hour and go to class. This will actually help you save tens of thousands of dollars–then you may know why this restaurant opening was such an exciting idea. Of course, I’m only about 10 minutes away from the old haunts of “downtown” Takoma Park but I’m still not down the creek very often these days. But one night I made plans to meet a friend who lives there (practically around the corner) for dinner one night to celebrate his new job. For anyone who is familiar with the nicer suburbs of DC, Takoma Park is a bit of an oddball in that it’s classy but it hasn’t been “hip” in a while. It’s also known as the “hippie repository” of the outer DC area. For anyone wondering why that might be, I happen to know exactly why that is: The Seventh-day Adventists. That’s right, those teetotal religious looneys who happen to have large churches on three major corners within the city, adjoining church offices and schools (elementary and high school), a university (from which I happen to have two degrees), and that rather large hospital (at which I happened to be born). Those were the original vegan hippies hailing from Battle Creek, MI. Spewing the usual Second Awakening Revivalist type nonsense about religion, the SdA’s had this really crazy thing against booze and meat. Some of their other school even to this day don’t have ketchup (because of the vinegar) or pepper in their cafeterias because of the church’s original health message. So how did this eventually affect my evening’s entertainment? Well what all this means is that Takoma Park, for a very long time was a “dry” city. To this day there are no liquor shops in the city limits and only recently was alcohol even a topic of discussion in many of the local cafe’s and restaurants. Partly, this was due the fact that the church folks practically owned the city (mafia style). Their headquarters were there, their churches, schools… so the actually passed legislation that prevented the type of locales that would bring in the type of people you see in the newer restaurants in DC. There have been cafe type places in Takoma Park for quite some time. The Capital City Cheesecake right down the sidewalk has been a favorite spot for coffee and pastries for years (since it was Savory’s). It was a rocky start for a place that didn’t seem to fit in with the neighborhood needs but it’s finally found it’s path and looks to be doing well. I enjoy reading my comic books and sipping coffee there many an afternoon when I was still working at the university. When it comes to restaurants there were Mark’s Kitchen and Middle Eastern Cuisine (from which many of my events at the university were catered) which have both been something like “fixtures” in the area. And we were all curious and twittering in anticipation when Roscoes began to put up signs. Roscoes, by the way, is named after a wild rooster that used to run around Takoma Park and was lovingly named Roscoe by locals. Roscoe was hit by a car and a memorial statue of him now stands where the weekend farmer’s market begins. I learned this all while not being very productive before finals week from a professor of mine. This photo is clearly somewhat outdated since you should be able to see at least some of the black “Republic” sign on the right. It looks like it was still Video Americana at the time this picture was taken. Video stores, another archaic item… But we were talking about Republic. Republic, which was oddly just ok this time around. It looks like a nice downtown restaurant but it had the crowd of…well… Takoma Park. We tried the drinks and they were what one would expect from a good DC bar. And the service was great. But the food needs work. It wasn’t bad but it reminded me of a dinner I had once in CA during those beach bum days where the person with me made the experience good but I don’t remember the food. Then again, I’m usually alright with that. in this case, however, something was a bit off. And If I go back and have the same experience I will definitely say something. Because when a sauce for empanadas can be described very quickly as “not-very-good-homemade-mayo” there is a serious problem. If you’re suddenly very concerned and thinking that this is a place to avoid, think again! Takoma Park is picky. If a restaurant like this can maintain itself in a city that’s fairly closed off yet open minded, please the natives, and yet still draw out downtowners into this rather small off-shoot from the DC diamond that’s something to keep in mind. Republic is still new to the area but I’d be interested to see with what they manage to turn into. They’ve already started off well with their interior designs, menu concepts (no matter what details still need a little tweaking), and the fact that they plan to add a patio and hire a music manager to coordinate. And from the original article (if you follow the link from the first photo of Republic’s interior) I see a lot of comments about Takoma Park not being funky. And it’s true. Takoma Park is just weird. But in an incredibly homey way. Republic, on the other hand is very SoCal (including the moustaches in some cases). This is a place where you raise a family but as more and more people in my age bracket are starting to do that, we’d like to bring a little more of the inner city into our suburban lives and it’s appropriately being started by someone who knows DC and also happens to be learning very quickly about some of us weird folks who got excited about an italian restaurant/cafe (across the street) named after a community chicken. Okay… Okay…! I know! What’s with the repeat blueberry items?? But hear me out. Imagine these made with a proper RASPBERRY preserve. I’m thinking Bonne Maman Raspberry preserves to be exact. Then it would be like a really good jelly filled doughnut only in muffin form… and if it’s called a muffin it has to be healthier, right? Anyway you chose to go with it, I think this is an excellent way to end Muffin Week.